These plans are for use with the Journeys reading series lesson 26 The Mysterious Tadpole leveled readers. Skills covered are: story elements, accuracy, /ōō/ (spelled with oo, ew, ue, and ou), phoneme segmentation, and multiple meaning words. This is a first grade reading assessment that I created from Journeys lesson 26. Assessments 1-25 are also available. I suggest copying it front to back. I will post each test through 30, as I edit them. This is a powerpoint that lists the spelling words, high frequency words, and vocabulary words and definitions to review with students from the second grade Journeys story "The Mysterious Tadpole". This can be used to practice the words whole group or even as a small group in centers. These are short answer written comprehension questions for use with Journeys Lesson 26 The Mysterious Tadpole and the guided reading leveled readers. The skill covered is Story Structure. Use the retell cards from Journey's anchor text to sequence events in the story. Student will cut and paste pictures in order and then write about it. This document comes with two differentiated versions (3 cards and 4 cards), and 5 differentiated recording sheets. 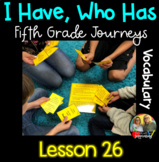 Here is a vocabulary booklet to help students practice the vocabulary words from Journey's lesson 26.